The crooks who run the Western financial system set up the gold market in a way that lets them control the price. 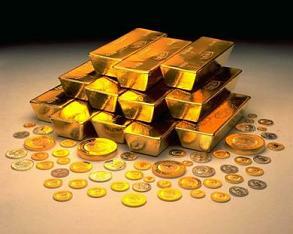 Gold is not priced in the physical gold market where bullion is bought and sold. Gold is priced in a futures market where uncovered contracts that are settled in cash are bought and sold. As the futures contracts do not have to be covered in the way that shorting a stock has to be covered, the bullion bank agents of the central banks can create paper gold by printing naked contracts. In other words, it is possible to inflate the supply of gold in the market in which the gold price is determined by dumping futures contracts on the market. The huge increase in supply of paper gold drives down the futures price of gold. This Western policy is stupid, because it drives down the price of real gold for the major Asian purchasers—China, India, and Turkey. But the policy protects the value of the US dollar by preventing a rising gold price that would show the growing lack of confidence in fiat paper currencies. The European, UK, and Japanese central banks have protected the US dollar’s exchange rate vis-a-vis other reserve currencies by indulging in quantitative easing themselves. With all fiat currencies inflating, the exchange rates stay relatively stable. The central banks prevent the rise in the price of gold by printing paper gold for the paper gold market. It is my view that bitcoin is the beneficiary of this rigging of the prices of gold and fiat currencies. Bitcoin cannot increase in supply, and bitcoins are not priced in future markets that permit naked shorts. Dave Kranzler explains today’s central bank takedown of gold. In order to protect their own irresponsible and probably illegal behavior, the central banks are committed to a policy that frustrates the efforts of people to find refuge in gold from fiat paper currency inflation. The policy of the central banks proves that the elite work assiduously against the interest of the people. Why do people tolerate the central banks which only serve the One Percent? Thomas Jefferson understood that as did President Andrew Jackson, but in the Western World insouciance has replaced intelligence. The One Percent know what they are doing. The 99 Percent are locked up in The Matrix. Here is Kranzler’s clear explanation of the rigging of gold markets by central banks. Of course, nothing whatsoever will be done about the crimes as they are crimes against the helpless 99 Percent, a collection of “deplorables.” Who cares about them? Certainly no Western government.